Your body is home to your spirit. We must care for our spirit’s home in both physical and spiritual ways so it functions at an optimal state for as long as the spirit needs it to navigate the physical world. Without the body, the spirit can not experience… anything. Not a hug or a good cup of coffee. I very much believe in reincarnation and that each life is filled with lessons our spirit needs to learn on our road to enlightenment and returning to the Divine – no matter who or what we consider to be the Divine. The spirit brings to its vessel tons of universal energy via energy points called chakras. There are seven major chakras from the base of the spine to the crown of the head. When the chakras are functioning at its best, they allow a free flow of energy, facilitating a balanced and healthy life. This gives you the ability to connect with the Divine and receive blessings of abundance. Sometimes the chakras need a bit of TLC to be at its best. Meditation, positivity and love for yourself and others is the best medicine out there. To help you along your path, here is a quick guide to the chakras. The Muladhara chakra is also known as the root chakra and it is your base of power. This chakra establishes survival, stability, and security in the physical world. It is where you create your foundation and store your beliefs about yourself. Recommended Mantra: Om Gum Ganapatiyai Namah (om gum gana-pati-yay! nah-mah) This mantra is said to have the power to remove all obstacles – both physical world and spiritual. The Svadhisthana chakra is the 2nd chakra. This is where your emotional and creative energies can be addressed. My belief is that when the root chakra is “happy” that energy is exhibited here, translated into physical-world emotions. If you’re feeling down, that emotion can be traced backed to a survival, security or stability issue. Meditating upon this chakra can help you either amplify good feelings or calm anxious feelings – it’s all about the intention you set when focusing on this chakra. Recommended Mantra: Om Namo Bhagavate Vasudevaya (om na-mo bah-ga-vah-tey -vah-sue-day-vah-ya) This mantra is said to deliver overall feelings of goodness, well-being, happiness. The Manipura chakra is the 3rd chakra and it is a source of personal power, your self-esteem, warrior energy, and the power of transformation. The energy here is what fires your willpower and self esteem. The Anahata chakra is our fourth chakra and serves as a bridge between our body, mind, emotions, and spirit. Hindu God association: The one you feel closest to. Being your heart chakra, this chakra is what connects you to that higher power/deity that you hold in your heart. When in doubt, think back to which was more prevalent in your childhood. An alternative is to choose a form of Shakti (Durga, Kali, Lakshmi, Saraswati). Recommended Mantra: Determined by personal choice. 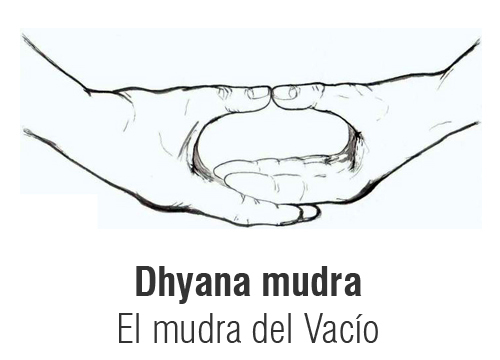 Recommended Mudra: Determined by personal choice of God. The Vishuddha chakra is our 5th chakra and it’s where our power of manifestation comes from. Have you ever heard the saying, “Words have power”? They weren’t kidding. The Ajna chakra is our 6th chakra and is also known as our third eye. This is your center of intuition. Your “sixth sense”. The Sahasrara Chakra is located at the top of the head/crown and is our connection to the universe and the Divine. It is our source of enlightenment and spiritual connection allowing us to experience unity and the selfless realization that everything is connected. Hindu God association: Your personal deity. See Anahata chakra information above. Recommended Mantra: See Anahata chakra information above.